With the launch of Restitution, I will have finally achieved the holy grail for indie authors – the trilogy. And this seems like an opportune moment to reflect on the progress Crazy Amy and I have made together. When I started out with the first book, I had no idea it would be the beginning of a series. My primary purpose was to write a thriller with a heroine who had suffered the same traumatic childhood as me – growing up with a mother who was a hoarder. I’d come to recognise how much my dysfunctional upbringing had affected me and wanted to examine this in a fictional context. How would a woman weighed down by an unhappy history react if pitched into a nightmare scenario? What if her sanity and competence were called into doubt? Would the legacy of the past crush her, or give her an inner grit denied to those who’d enjoyed an easier life? The plot gave me plenty of scope to explore this dynamic. Amy is at the top of her profession as a partner in the fictional global accountancy firm of Pearson Malone, and has successfully hidden all her inner struggles from everyone at work. But her life implodes when a junior colleague is murdered and she suspects Ed, her bully-boy boss. Ed uses gaslighting techniques to try and discredit Amy, and to save her job, her sanity and her life, she has to find a way to fight back. I had a lot of fun creating Ed, who is the perfect amalgam of the most toxic people I ever worked with. Being totally frank, I sometimes even wonder if there is something of me in his self-serving opportunism. Of course, people like Ed sniff out insecurity like a shark smelling blood, and with all her hang ups, Amy is the perfect victim. Yet she is determined not to let him destroy her. On the other hand, writing Amy was a painful process, though ultimately cathartic. She is different from me in many respects, but we were inextricably bound together by our shared profession and childhood experiences. It took me three years to write Concealment, during which time I also suffered personal tragedy when my sister died unexpectedly. At one stage I felt so dispirited that I put the draft aside and began writing something else. But in the end, Amy compelled me to return to the manuscript and against all the odds I completed the project. After all, Concealment is the book only I could write. With the finance-based plotline and the hoarding weirdness, it was never going to be a mass market best seller, so I decided to self publish. To my immense surprise it did well, being regularly in the Top 10 of financial thrillers on Amazon in the UK. People either loved it or hated it. Some couldn’t get past the financial details and others found it pushed some uncomfortable emotional buttons. But Amy’s situation resonated with many readers. They particularly enjoyed Little Amy, the hallucination of Amy’s fourteen-year-old self who plagues her as her mental health deteriorates. And everyone wanted to know what happened to Crazy Amy (as she’d come to be known) next. Thus Exposure was born, where Amy takes on an undercover assignment following the suspicious death of a former colleague. By assuming a new identity, she gains many insights into herself. Moreover, the reader is also offered a new perspective. Whereas Concealment was written almost completely in the first person from Amy’s point of view, Exposure uses multiple third person viewpoints. Now it becomes clear that Amy is not quite the victim she appeared to be in Concealment. Indeed, some aspects of her personality are quite unpleasant. However, to Amy’s credit, she does at least begin to recognise this and consciously tries to improve. I enjoyed writing the workplace-oriented stories of the first two books, and still feel that this is an under-represented genre, given how much time we spend at work. But I now needed to expand on other facets of Amy’s personality, and so in Restitution she heads off to Prague on the trail of a long-lost Picasso. And since her travelling companion is Evil Boss Ed’s elderly father, I was also able to provide more background to Ed’s issues and what makes him tick. By the end of the book, Crazy Amy emerges as a more secure and rounded person. After completing Restitution, I was surprised to find that although each book can be read perfectly well as a stand-alone thriller, the trilogy seems to have its own narrative arc—almost as if it had been planned that way from the outset! And though I believe I’ve improved as a writer, I wouldn’t change the earlier books. Concealment is perhaps a little heavy on the financial details (an aspect that’s progressively lighter as the trilogy goes on), but this is where I was on my journey and what I needed to write at the time. I’m not done with Amy as a character yet, and I have exciting plans for her future, with her life taking a dramatically different turn. If you haven’t met Amy yet, here are the links to all the books so you can check them out. And to existing Crazy Amy fans, I’d like to say a big thank you for reading, reviewing and giving valuable feedback. You have all helped make Amy the woman she is! 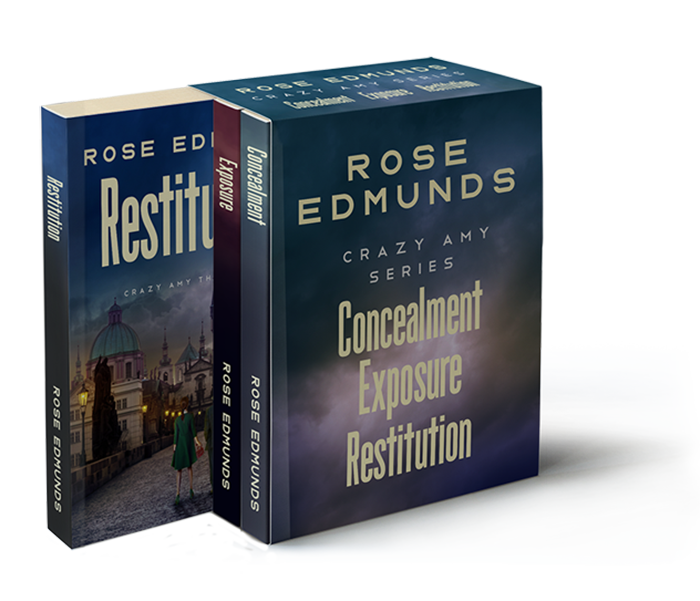 From 28 March to 03 April the ebook version of Concealment (Crazy Amy Book 1) will be on sale in the UK and the US for 99p/99c (normal price £1.99/$.2.99). 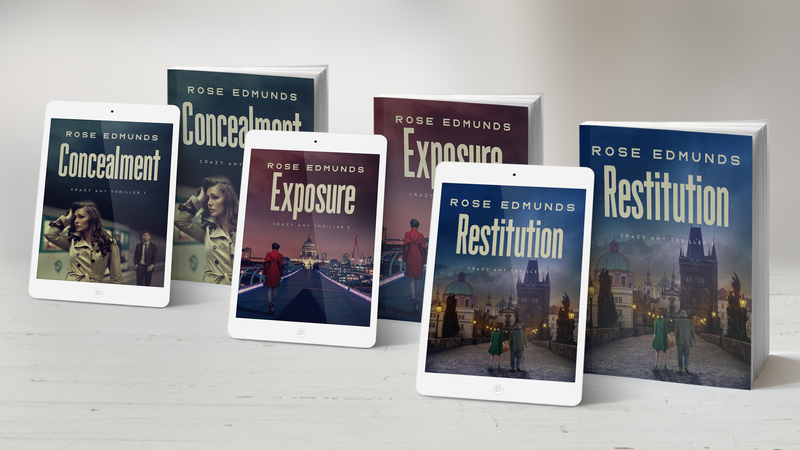 From 04 April to 10 April the ebook version of Exposure (Crazy Amy Book 2) will be on sale in both countries, also for 99p/99c (normal price £1.99/$2.99). When an old friend dies in suspicious circumstances, Amy’s decision to investigate pitches her into a nightmare where no one can be trusted and nothing is what it seems. In mortal danger, and with enemies old and new conspiring against her, has Amy made her last mistake…? 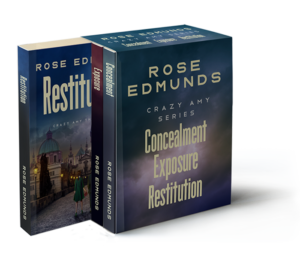 The ebook version of Restitution (Crazy Amy Book 3) is priced at £1.99/$2.99. You can view and buy it by clicking this link viewbook.at/Restitution. This entry was posted in Blog Posts and tagged book launch, Crazy Amy. RESTITUTION (CRAZY AMY 3) LAUNCHES TODAY!